Especially for Christmas presents, but also for Christmas food and drink, and all the other things required over the Christmas period. 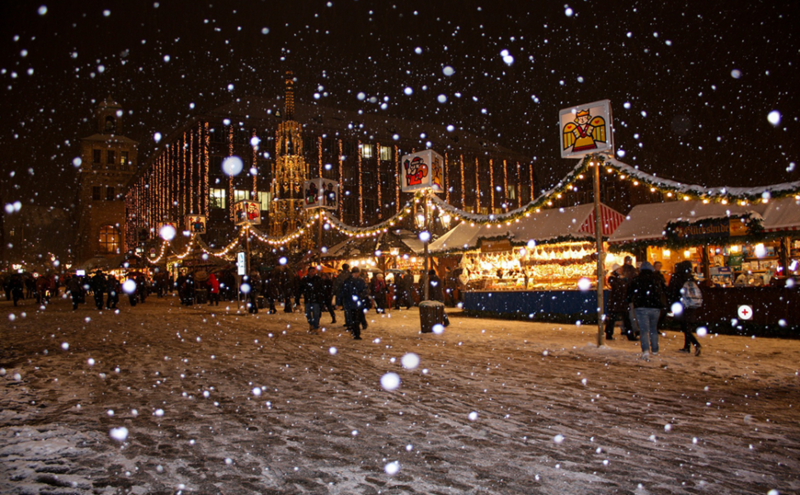 "See you at the Christmas Fair". Salut and welcome to our latest Kinfo newsletter! 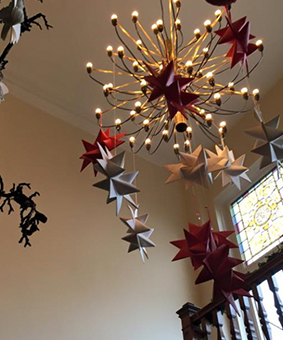 Find previous Kinfo newsletters here, but first read up on some of the festive fairs and carol services happening in the capital, as recommended by our wonderful parents on Kinfo. Everyone's at it, planning dates, tentatively dipping toes through the green and red-painted doors that lead to Christmas 2017. Now is probably a good time to think about shopping, before you find you've gone and spent all your money on sparkling outfits, mince pies and excessive parties. William the Conqueror was crowned here on Christmas Day 1066 following the successful Norman invasion of the British Isles. 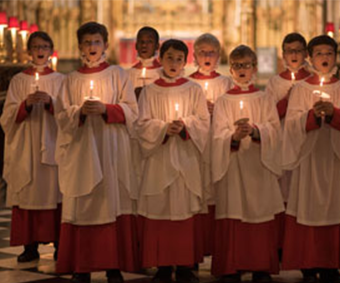 It’s a scramble to get tickets for the popular carol services on 23rd and 24th, which a mum of two recommends: “We definitely feel festive in the company of esteemed choirs inside this truly historic 700-year-old abbey”. Check the link for other highlights. Marylebone is pretty at any time of year, but walking among the elegant mixture of Georgian terraces, Victorian mansion blocks and Art Deco-style architecture at Christmas feels triply atmospheric. This weekend, costumed vendors sell Swedish decorations, frozen reindeer, Glögg (mulled wine with raisins and almonds), candles, and more in this church hall. God jul! And go "as early as you can possibly can," says this regular on Kinfo. High-density tourist action guaranteed at London’s epicentre. 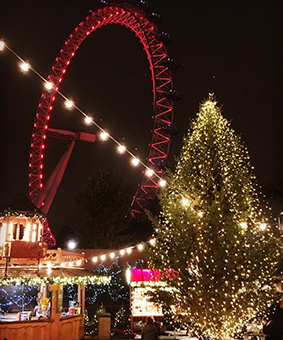 Open daily until 10pm, browse the authentic Bavarian-style wooden huts selling hand-crafted toys and festive ornaments for free; pay for the spiegeltent shows and the Santa's Grotto (they still have plenty of availability, here). "So Christmassy," says this mum on Kinfo. "Organised fun doesn't get much better than this!" says a dad of two. 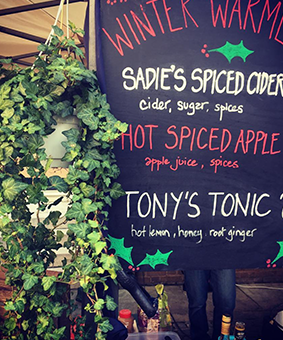 This year sees a Finnish Rooftop Sauna, Nordic music, seasonal goodies and street food next to the lit-up London Eye. If we were free in the day time, we'd be at the free ABBA singalong (17/12, 1pm). Older kids will enjoy the fairground rides and weekend food market. It wouldn’t be Portobello without live steel pan and calypso bands whipping visitors into a celebratory mood. 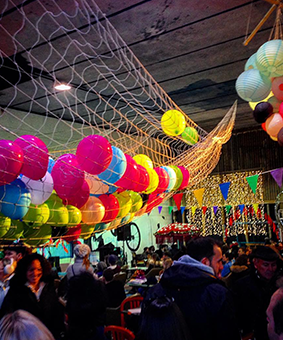 There’s also a Santa's grotto, an “alternative Christmas Market” plus a Winter Moorish Bazaar. “Lovely, community event, the second best weekend of the year here, the kids love it!” says this parent on Kinfo. 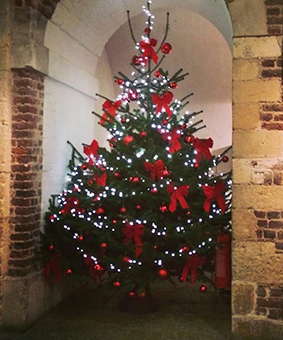 Our tipper recommends the family concert on December 2 for the “great acoustics and café in the crypt”. Can’t make that date then there are BBC Radio 4, English Chamber Choir, Norwegian Concert, Christmas Gala by Candlelight and Parish Carol events to choose from. In the north-westerly reaches of Greater London lies Manor Farm Ruislip, a heritage site, home to Ruislip Duck Pond Markets for the last 9 years. Food and craft stalls abound, and you're near the Ruislip Lido woods. "We eat a lot of tasty artisan food here," says this tipper. Well, it is Christmas. “It’s so pretty, such a special venue especially at this special time of year” says a mum of one. 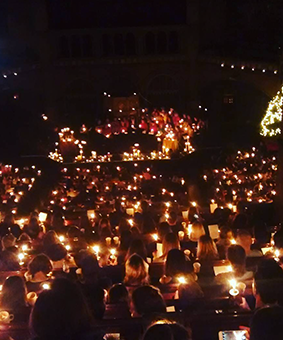 The candlelit evening carol service features traditional readings and music that celebrates the Christmas story. 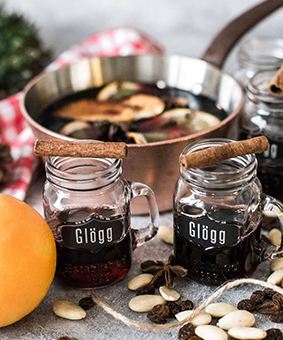 It's all about the hygge, especially at Christmas! "So scandilicious! We love going every year. Small and affordable," says a mum of 2. £2 entry.